I am back from my Foodie weekend in Baton Rouge and I will tell you I had the best time ever! I met some wonderful bloggers, ate amazing food that I would never of dreamed of trying and saw some amazing sites that I would never of thought would be so fun!! I am happy to be home, but I am also sad because my trip was so short. I can’t believe how much fun it is in Louisiana! I told my Husband we are going back next spring for a vacation. The only downfall about the trip was the weight I gained. I never ate so much food in my life. I couldn’t help myself because everything was new and so good! If you follow me in Instagram, you will see all of the food I tried and yes, I ate just about everything I took a picture of. I know, insane!!! I will fill you in on everything on a later post! But now that I am home, I was in need of a clean healthy dinner and I think my Husband was too! 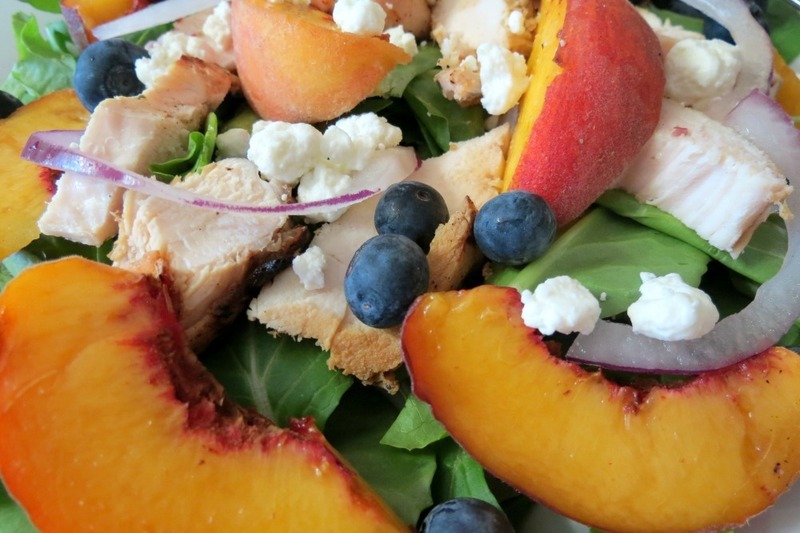 So today I am sharing with you last nights dinner, which is my Blueberry Peach Chicken Salad. This salad is so light, refreshing and so full of summer flavor!!! I made it in a snap too! When I told my Husband what I was making for dinner, I asked did you want a salad? He actually said yes!! Shocking!!!! I guess he wanted something a bit more healthier, since I left him home this weekend and from what I gather he ate fried bologna and onions, steak and who knows what else. All of my produce was not touched so you can imagine nothing healthy made it to his belly this weekend, and I guess I could say the same. 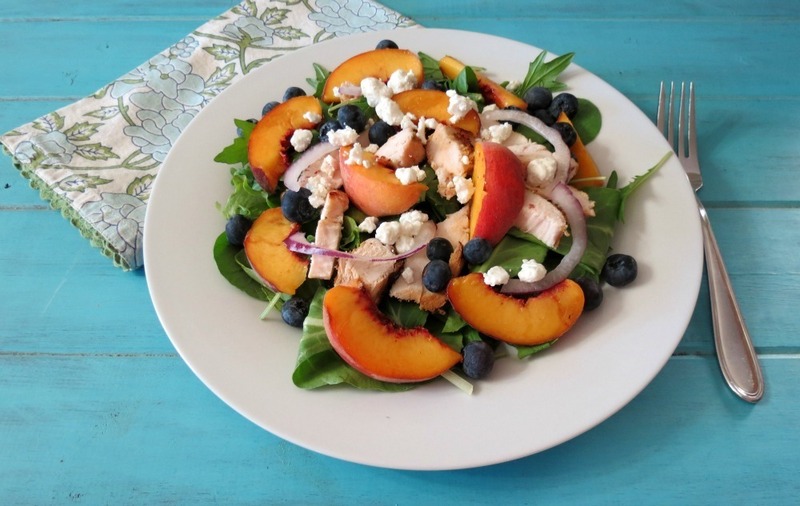 This salad is made with fresh peaches, blueberries, mixed greens and some grilled chicken that I had leftover from a recipe that I will be sharing with you on Sunday and some crumbled goat cheese. Feta cheese would also work very well with this salad! 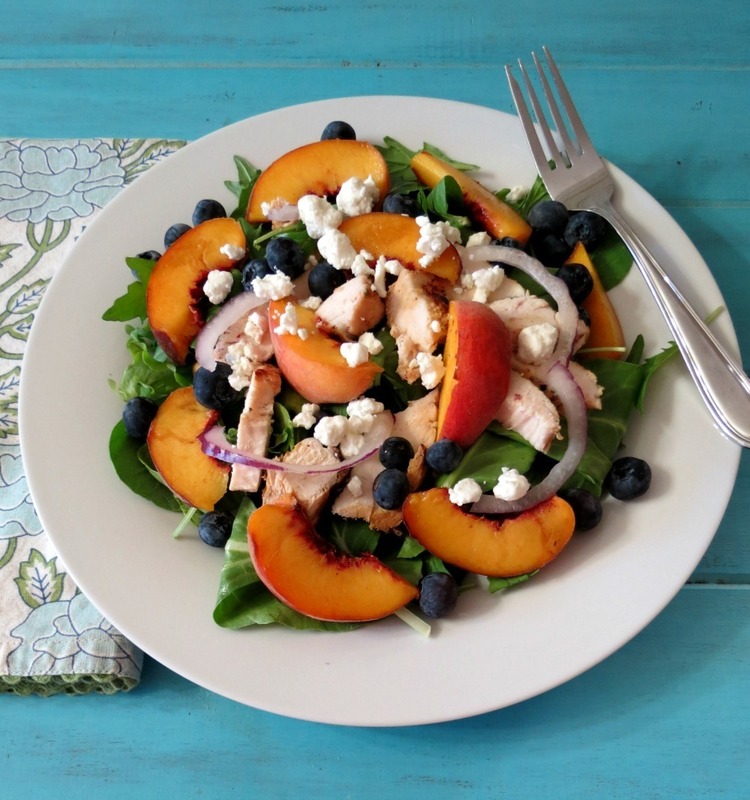 I simply love the combination of peaches and blueberries and they really compliment each other in this salad. Not only does the salad taste so amazing, it’s also so pretty! I love the colors together. It makes for an inviting salad that you can’t turn down! 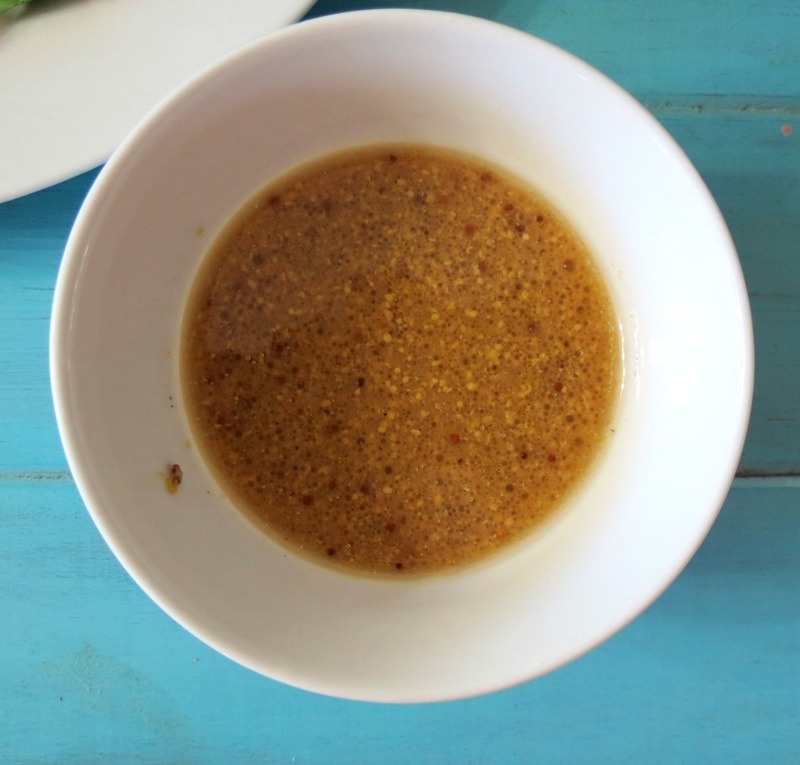 I also made a simple dressing of olive oil, balsamic vinegar, dijon mustard and water. It’s light and has a slight zip to it. It goes great with the fruit and the chicken. If you’re not into making salad dressing, a simple balsamic dressing would be wonderful on this salad also. You could also cheat and use chicken from a rotisserie chicken if you don’t feel like grilling your own. I almost did that, but realized I had some chicken in the fridge that I wanted to use. If you want to grill your own chicken, I used my Yogurt Marinade Recipe for the grilled chicken. It turned out so moist and delicious!! One of the best chicken recipes I have made! 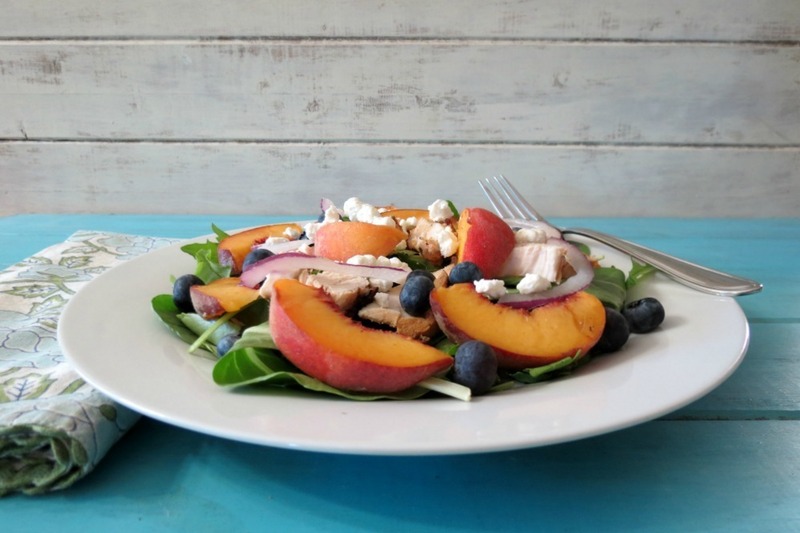 A light refreshing summer salad made with grilled chicken, peaches, blueberries and drizzled with home made balsamic dressing. In a small bowl; whisk all of the dressing ingredients together; set aside. Divide the salad mixture between two plates and evenly divide the dressing over the salad. Well my Friends, I am exhausted. I got home at 11pm on Sunday and had to get up for work at 3:30am. I am going to thumb through some of my Louisiana magazine and just chill for the rest of the night! I’m glad you enjoyed your trip to Louisiana. So much good food! I couldn’t have resisted either!! I loved Louisiana and I will be sharing some stories with you next week!! Gosh I always love your recipes! Sounds like a great combo of flavors, YUM! Oh my I don’t know how you get sooooo many recipes done in so little time! There must be a secret! LOL! Girl, I have no idea how I get my recipes done! But I think I am starting to get burn out! There is just not enough time in the day! I love the peaches this year! SO fresh and juicy! I need to freeze some so they can carry me over the winter! This looks so delicious! I love switching up my salads and this looks perfect! I know I need to switch it up because I eat the same vegetable salad for lunch, so I need to zip it up for my dinners! Wow, yes please! All these ingredients sound so good together! Thanks Marie! They do go very well together! I love peaches and blueberries together!! Yum! I love foodie events!! Sounds like you had a great time 🙂 Don’t worry, it is nice to pig out once in a while, and at foodie events it is a MUST 🙂 This salad looks wonderful! Isn’t chicken with fruit THE BEST?? And this is so beautiful, too! Jennifer, this is a simply beautiful salad. I feel the same way after a great vacation full of tons of food – I need to come home and eat FRUIT AND VEGETABLES, stat!!! haha. This is such a beautiful summery salad! Thank you so much!!! I’m going to miss the summer when it’s gone. I love this salad! What would you substitute for the goat cheese, though? Hi Tess! I would use feta cheese or even Gorgonzola cheese. Or omit cheese if you don’t want any. I love salads like this, sweet and savory at the same time and so ……. pretty!! Ahh thank you Chris! Love the sweet and savory together! Well, you did it again girlfriend!!! Love it, love it, love it!!!!!! Thank you!! !